NEW YORK, April 25, 2017 – Lady Gaga, Google, Malcolm Gladwell, Jimmy Kimmel Live!, Lena Dunham’s Women of the Hour podcast, and The New Yorker are among the Winners of the 21st Annual Webby Awards. This year’s Winners will be recognized alongside Special Achievement honorees, including artist Solange, actor Steve Buscemi, advocate and CNN contributor Van Jones, Internet Archive, and the groundbreaking Women’s March. Academy judges—including Jimmy Kimmel, Making a Murderer’s Laura Ricciardi and Moira Demos, TED Radio Hour Host Guy Raz, Instagram’s Eva Chen, Questlove, Internet inventor Vint Cerf, Reddit Co-Founder Alexis Ohanian, and Black Lives Matter Co-Founder Opal Tometi—selected this year’s Webby Award Winners. In addition, more than 3.5 million votes were cast from internet fans in 235 countries and territories around the world to choose the Winners of the Webby People’s Voice Awards. Hosted by critically acclaimed comedian and actor Joel McHale, this year’s star-studded ceremony in New York will celebrate the most innovative, inspiring, and entertaining work on the Internet. 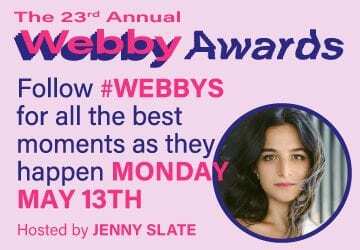 The show will be available on demand at webbyawards.com the morning of Tuesday, May 16, and The Webby Awards video channel will feature all the show highlights and hallmark 5-Word Speeches from the night’s big Winners. Webby Social Movement of the Year: The Women’s March for using the Internet to embolden a major social uprising and awakening. What began as a simple Facebook post by one woman in Hawaii quickly became the drumbeat for a global activist movement. The Women’s March organizers used the Internet to assemble the largest demonstration on a single day in U.S. history and have successfully leveraged social media to promote education, awareness, and unprecedented online and offline engagement. Webby Lifetime Achievement: InternetArchive.org for its commitment to making the world’s knowledge available online and preserving the history of the Internet itself. With a vast collection of digitized materials and tools like the Wayback Machine, InternetArchive.org has become a vital resource not only to catalogue an ever-changing medium, but to safeguard a free and open Internet for everyone. Webby Best Actress: Gillian Anderson for her role in the acclaimed crime drama series The Fall. With the recent release of Season 3 on Netflix, Anderson continues to bring her riveting performance as the tenacious, cool-headed Detective Superintendent Stella Gibson to digital screens everywhere, making the show a must-watch and a major win for online streaming. Webby Best Actor: Steve Buscemi for his role in the must-watch web series Horace and Pete. Buscemi’s astounding performance in the exclusively online series, combined with the show’s uniquely relevant themes and tone, have made Horace and Pete an Internet fan favorite. Buscemi will be presented by his co-star, 2012 Webby Person of the Year Louis C.K. Webby Special Achievement: Van Jones for his use of the Internet and social media during the 2016 election to educate audiences and inspire action. Through his eye-opening and politically diverse series The Messy Truth, Jones leverages traditional and online media to promote diversity and showcase the positive impact the Internet can have on grassroots organizing and advocacy efforts to move the dial on important issues. Webby Artist of the Year: Solange in celebration of her extraordinary use of the Internet to support fellow artists, especially artists of color, and promote diversity. With her 3 million Twitter followers and through Saint Heron, her collaborative platform and online store for artists, Solange has created a unique platform for collaboration and connection on the Internet.